You are here: Home / Corrugated board web cleaning – why? Corrugated board web cleaning – why? Why would you need a corrugated board web cleaning solution? This has to do with the substrate, the production process and the increased need for clean and print-ready corrugated board. Corrugated board is constructed of several layers of Kraft-paper, a paper made of chemical pulp produced by the Kraft process. This paper is stronger than that made by other pulping processes; acidic sulphite processes degrade cellulose more, leading to weaker fibres, and mechanical pulping processes leave most of the lignin with the fibres, whereas Kraft pulping removes most of the lignin present initially in the wood. Low lignin is important to the resulting strength of the paper, as the hydrophobic nature of lignin interferes with the formation of the hydrogen bonds between cellulose (and hemicellulose) in the fibres. The name “Kraft” comes from the German and means “strong”. The construction of the Kraft paper is by definition rough and fibrous; the paper has a considerably higher level of surface contamination compared to virgin-fibre massive board types. In Europe, the use of virgin kraft paper is low, as the recycled papers have gained the maximum percentage of use due to cost reduction. But also because of the advancement of the newer paper mills, enabling them to manufacture versatile and high-performance papers. As the thickness of the corrugated and the amount of layers increases, the slitter knives generate more slitter related contamination. Wear of the slitters is an additional reason why the slit is not only less precise but also creates a lot of dust-related problems. The increasing demand for packaging that is not only strong and protective – one of the critical features of corrugated board – but also can be used for displays leads to a growing demand for unique graphic techniques and printability*. Therefore the use of a web dust elimination system is essential. The fewer fibres, debris and dust remains on the printable surface of the corrugated board, the better the outcome of graphic design and print quality. This trend will continue in the future. Packaging in smaller quantities, adapted to specific markets and needs, leads to shorter runs, where the reduction of clean-up requirements improves productivity. Printing on corrugated board – which method? Producing corrugated board with pre-printed liners is only affordable when the circulation is of a suitably large volume. The use of pre-print makes the corrugator less flexible. As the amount of prints is reducing, the use of liners gets less economically justifiable. Besides, the quality difference between the use of pre-printed liners and direct printing is decreasing. Modern techniques are rapidly closing the gap. To provide customers with what is demanded by the market will increase the need for high-grade printing and individualised designs. Increased printability, reduction of waste and failures and demand for constant quality are vital features to modern corrugating. The use of knife dust extraction on the slitters, a reliable web cleaner after the slitter/scorer and the use of sheet cleaners after the cut off knife (after this process the web is no longer a web, but exists of single plates of corrugated) is inevitable to answer to a rapidly developing market. 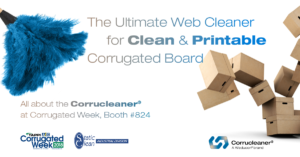 The Corrucleaner® HE 90 web cleaning solution for corrugated board and cardboard offers all you need to deliver the clean and print-ready corrugated board your customers need. Take a look at the cleaning principle of the Corrucleaner® HE 90 and find all the advantages it has to offer, like high cleaning efficiency, low energy consumption, low noise levels, an extension of wash up distances and more. Please contact us to discuss the specific challenges you meet: fill out our contact form, and we will get in touch with you! *Examples of today’s corrugated board applications.